Think of this as a sneak preview, a taste of things to come. Alicia Sy invited Mrs. MM and I to lunch at The Hungry Hound, which just opened a week or so ago and is definitely in very soft opening mode. Parts of the restaurant are still in the last stages of construction/finishing, and menu items are still being developed and finalized. I think there were schedules to be met (read perhaps nothing can open during ghost month…) so if you are going for a serious chunk of their menu, give them another month or so… but if you are one of those who have to be amongst the first to check a place out, here are some dishes we tried at lunch today. The bar next door, niner-ichi-nana (917, Globe Building, duh) is probably going to become one of the hottest pubs/bars in the Fort for a certain crowd of folks. With custom mixed drinks, consultants and mixologists, it promises to be the scene and be seen place in the weeks ahead. 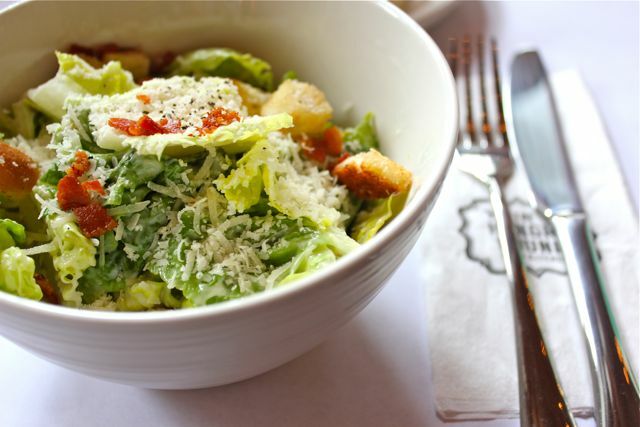 Up top, a small sized, properly made and authentic caesar salad. The hint of anchovy, the romaine lettuce and the generous sprinkling of parmesan was exactly how I like it. Don’t mess with my caesar salad. I would add a few constructive comments — go lighter on the dressing (ours was drowning in it) and taste the croutons which were a tad soft and chewy and only browned on one side. Otherwise, one of the better examples of a caesar salad I have had recently. 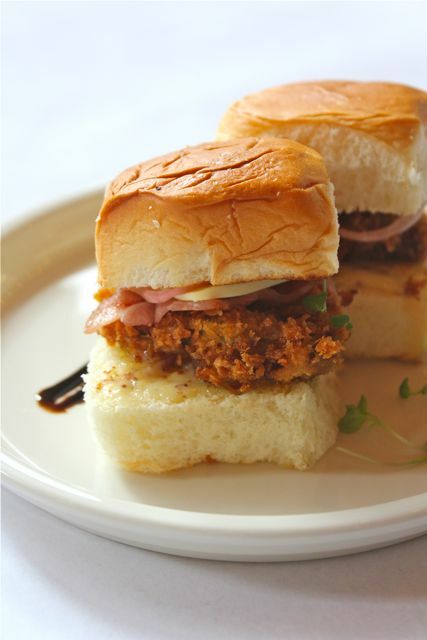 Next up, two sliders with battered and fried oysters, some bacon and soft white bread. Very good. Definitely liked this dish. Perfect with a cold beer or two. “Good Morning Linguine” — except ours was made with fettucine. A sort of deconstructed carbonara meets alfredo. 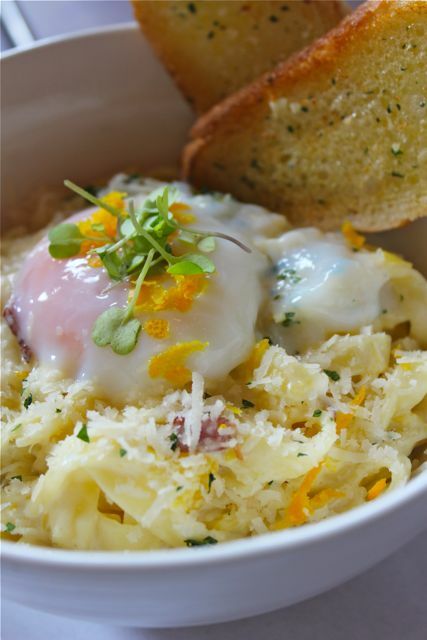 It came with a creamy and cheesy sauce, topped with poached egg and garnished with fresh lemon zest. I am a purist when it comes to carbonara, but I considered this a far enough version to stand on its own. I can say this, it was RICH. Three of us split this bowl, and I liked it, but I don’t think I could finish an entire bowl of it myself. It came with buttered slices of bread that were crisp and delicious. The lemon zest was a nice foil to the creaminess. Pinoys who like rich creamy pastas will love this dish. 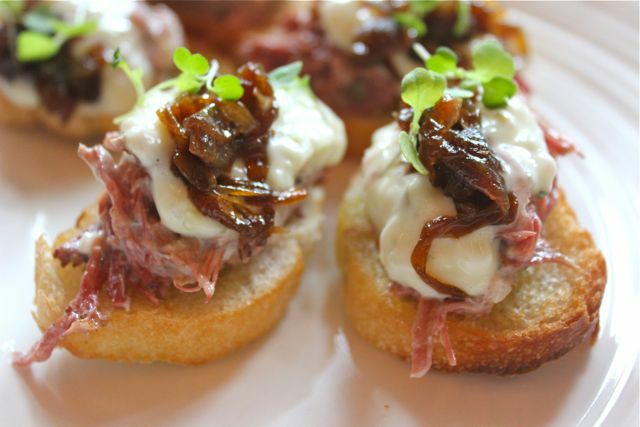 Corned Beef Rillettes — nice idea, execution needs improvement. Corned beef done in-house was tasty but excessively salty, topped with a cheese or cream-based sauce and some caramelized onions and arugula microgreens. The killer on this one was bread that tasted a day old, chewy and totally off. They could have toasted this until it was dry and hard, or used other bread. The chef later told us they would be changing the bread. Again, with a few tweaks this will be a nice pica-pica to have with drinks. 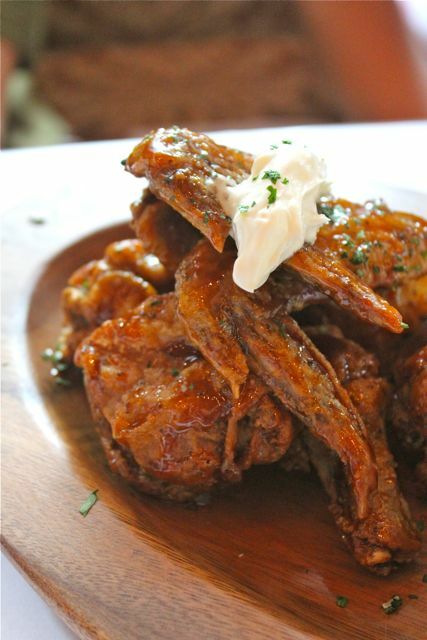 Hot Chicks — deep-fried chicken wings that were neither hot nor spicy but glazed with a rather sweet sauce and served with blue cheese and a pickled relish. Not one of my favorites. A new take on buffalo wings, perhaps, but this didn’t make an impression on the first time out. 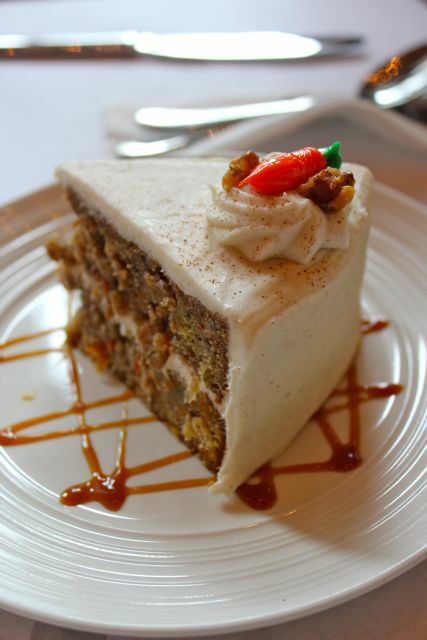 I don’t really order dessert at restaurants much, but we had a taste of their carrot cake. 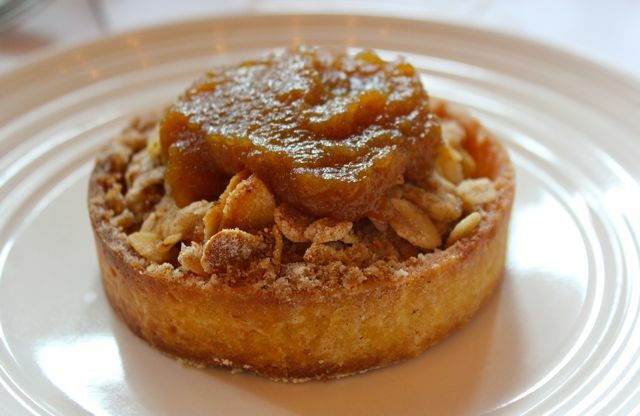 And an apple tart that was served cold but which they may consider serving hot instead. Overall, an enjoyable lunch and we would definitely go back once they have their full menu on offer and the kitchen has had a month or more to get into its groove. With Chef Gilbert Gomez who worked at Daniel Boulud’s DB Bistro Moderne in New York and Chef Jerome Opriano of The Goose Station, the kitchen comes with serious wattage. It’ll be good to see what they pull off in the months ahead. There aren’t many seats in the restaurant, say 40 or so, and the bar next door looks like it would be a fun place to stand and mingle when the crowds get heavy. Plan on spending say PHP800-1,000 per head with softdrinks. Add more if you plan on beer, wine or liquor. So glad to see you are in numerous posting mode! The bread pictures look like they were a day old, even the slider’s buns look dry and crumbly. P800-1000 is a bit pricey. i still have yet to find a resto in the BCG area that is really value for money. 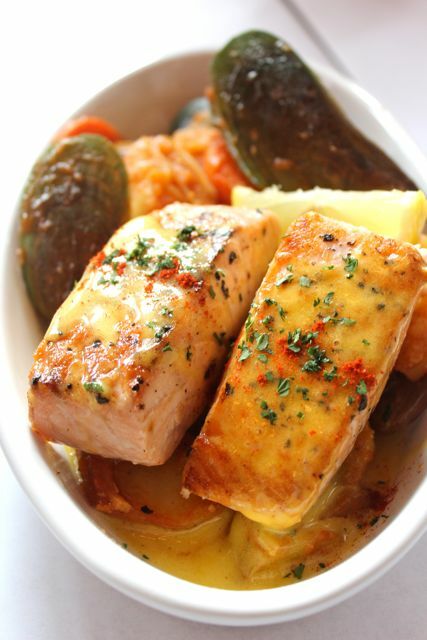 Most of the time, i leave the resto feeling robbed or cheated. – hollandaise instead of bearnaise which is more suitable for beef. – get rid of the mussels. – use asparagus, snowpeas, potatoes for veg OR simply quick sauteed Jap cucumbers & potatoes. Keep warm while……..
– poaching the salmon: boiling, concentrated, aromatic broth poured over it and sealed for 10 mins per inch( adjust timing for doneness. It varies due to several factors. ). Thereafter, top with hollandaise and blow-torch to perfection. Done this way, the dish remains warm without being so hot the hollandaise splits. The richness is also balanced. Nice & honest write up. My personal opinion is the dishes featured looked too rich for my taste, but I guess that’s what pub food traditionally is(?) . I’m one of the few who eschews parmesan on my salad. I like Caesar’s but dressing is always on the side so I can just drizzle a tiny bit. I used to hang out at the Fort when my sister was still working there. I frequently find myself crossing the street to Market Market for cheaper food. I’m curious to try their caesar salad. Up to this day, I am still in search for the perfect one. My personal favorites as of today are oyster sliders ( i had four to myself :)), Bolognese with Morcilla and Cured Sausage, The Roasted CHicken which isnt sous vide yet daw because that equiopment hasnt arrived as well and the Salmon with mussels. i think i’ll start with the dessert first and keep it on hand throughout the whole experience. Ive been using MM’s Caesar’s salad dressing recipe for a long time. Really good. If you want good Caesar’s salad, make your own. I’m looking for a bar that serves great finger foods. Some place I can enjoy after work… just like what they have in Italy or France. Sad to say, for the price that I pay, I get watered down drinks and blah food quality. It’s most probably the cost of rent. I can’t believe I pay more taxes per year than some of the establishments in BHS. Utterly ridiculous. Looks promising, especially those sliders (fried oyster!! ), the caesar (the hubs’ favorite), and that good morning linguine (love the look of that egg). Will try but will give them some time to work out the kinks as you recommended. I haven’t been able to visit here as much as I would like (new baby :)) and I see some posts I already have to bookmark (braised pork belly, braised short ribs, and marmalade cake!) :) Hope all is well! !